O God, who have united the many nations in confessing your name, grant that those reborn in the font of Baptism may be one in the faith of their hearts and the homage of their deeds. Through our Lord Jesus Christ, your Son, who lives and reigns with you in the unity of the Holy Spirit, one God, for ever and ever. 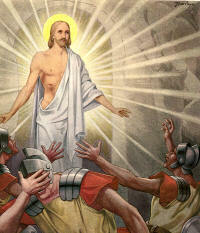 "This is the day the Lord has made, Alleluia! Let us rejoice and be glad, Alleluia!" The feast of St. Mark, which is ordinarily celebrated today, is superseded by the Easter liturgy. Shallow minds are easily scandalized at the thought that, despite Christ Jesus' divine mission and His heroic earnestness in fulfilling it, despite the limitless possibilities of the Sacrifice of Calvary glorified in the power of the Resurrection, even now so many human souls are still sick and diseased, even dead in sin and seemingly lost in impenitence. "Come, eat My bread, and drink the wine which I have mingled for you. All you that thirst come to the waters, and you that have no money, make haste, buy, and eat: come ye, buy wine and milk without money! Come! to experience the virtue of the waters, and of the food, and of the medicine, and of the fire. Come and drink lest you die of thirst! Come and eat lest your soul hunger and starve! Come, approach the fire of My charity, to be stirred out of your spiritual coldness and numbness!" — Our Way to the Father by Rev. Leo M. Krenz, S.J. At Rome, the Station is in the Basilica of the Twelve Apostles. The newly baptized were brought, today, into the church dedicated to the witnesses of the Resurrection, where repose the bodies of two out of the twelve: St. Philip and St. James the Less. An ancient inscription shows that this church was formerly dedicated to Philip and James.